A funny mustache keychain that will be the perfect portable disguise. Available in red, blue, green, yellow, gray, and brown. The ‘stache itself is made of white felt that has been hand stenciled with black acrylic paint. It is cut out and machine free stitched onto the colored felt. Each free stich design comes out differently. The key ring is attached by a colorful ribbon, which is then sewn securely inside the felt. This piece is machine sewn around the edges with invisible thread. The entire piece is heat pressed with an iron to ensure permanence and aesthetics. This keychain has been filled with store grand sand as opposed to poly fiber stuffing. It remains light weight and sturdy while giving the piece a unique feel. However, I would gladly make a fish with cotton stuffing upon request. 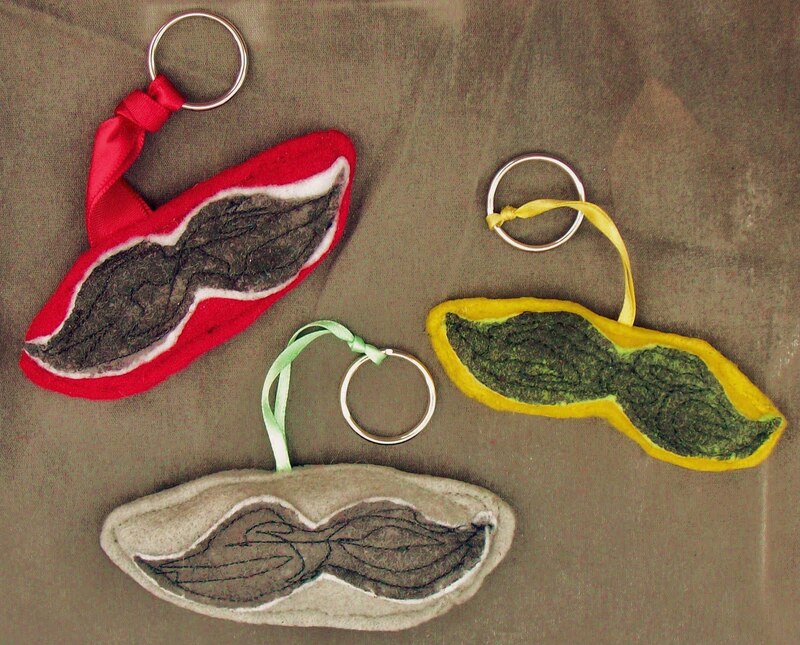 Because they’re all different, each mustache keychain’s measurements vary slightly. The moustaches themselves span approximately 3 to 3 ½ inches long and are around 1 to 1 ½ inch wide. The length of the key ring and ribbon are 2-3 inches on average. SOLD OUT! 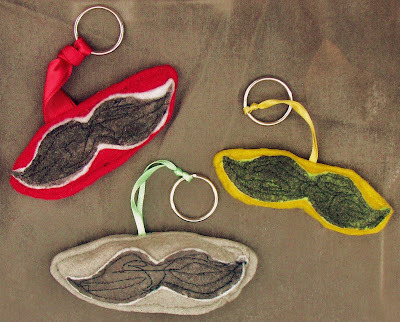 Leave me a comment if you are interested in a custom mustache keychain.